The volume of one oil barrel is equivalent to 42 US gallons. A barrel is correctly abbreviated to “bbl”. Barrels aren’t really used for transporting crude oil anymore. Instead, oil moves in bulk through pipelines and in tankers. “Barrel” is just used as a unit of volume these days. The world-famous Eton College is just a brisk walk from Windsor Castle, which itself is just outside London. Eton is noted for producing many British leaders including David Cameron who was British prime minister from 2010 to 2016. The list of Old Etonians also includes Princes William and Harry, the Duke of Wellington and George Orwell. Author Ian Fleming was also and Eton alumnus, as was Fleming’s iconic character James Bond, although the 007 was expelled by the school. Windsor Castle is located on the River Thames in Berkshire, just 20 miles outside London. It was built in the early 11th century by William the Conqueror after the Norman invasion of England. Queen Elizabeth II likes to spend her weekends at Windsor. She has lots of room to move around there, as it’s the largest inhabited castle in the world. Palau is a tiny island nation lying 500 miles east of the Philippines, and 2,000 miles south of Japan. Palau was once a Spanish possession and was sold by Spain to Germany in the late 19th century. During WWI, Japan invaded the islands (Japan had declared war on Germany) and was awarded the islands as a territory by the League of Nations at the end of hostilities. In WWII the US took Palau from the Japanese in a bloody battle in 1944. Palau emerged from American administration in 1994 and is now a sovereign state. The reality show “Survivor” is based on a Swedish television series created in 1997 called “Expedition Robinson”. We use the term “John Hancock” to mean a signature. The reference is to the large and flamboyant signature placed by John Hancock on the Declaration of Independence. Hancock was President of the Continental Congress from 1775 to 1777. 19. Epithet never actually used by Jimmy Cagney : DIRTY RAT! Cole Porter was a little unusual amongst his peers in that he was one of the few successful songwriters who wrote both lyrics and musics for his compositions. Porter was seriously injured in a riding accident when in his forties and was left disabled and in pain. Despite this, he continued to work and produced his most successful work after the accident. Merlot is one of the main grapes used to make Bordeaux wines, along with Cabernet Sauvignon, Cabernet Franc and Petit Verdot. The term “U-boat” comes from the German “Unterseeboot” (undersea boat). U-boats were used primarily in WWII to enforce a blockade against enemy commercial shipping, with a main objective being to cut off the supplies being transported to Britain from the British colonies and the US. The epic fight for control of the supply routes became known as the Battle of the Atlantic. Our term “picnic” comes from the French word that now has the same meaning, namely “pique-nique”. The original “pique-nique” was a fashionable potluck affair, and not necessarily held outdoors. Surprisingly (to me! ), our word “mall”, meaning “shady walk” or “enclosed shopping space”, comes from the Italian for “mallet”. All of our shopping-style malls are named for “The Mall” in St. James’s Park in London. This tree-lined promenade was so called as it used to a famous spot to play the croquet-like game called “pall-mall”. The game derived its name from the Italian for ball (palla) and mallet “maglio”. The London thoroughfare called the Mall still exists, at one end of which is Buckingham Palace. Indeed, parallel to the Mall is a street called Pall Mall. Rosa Parks was one of a few brave women in days gone by who refused to give up their seats on a bus to white women. It was the stand taken by Rosa Parks on December 1, 1955 that sparked the Montgomery, Alabama Bus Boycott. President Clinton presented Ms. Parks with the Presidential Medal of Freedom in 1996. When she died in 2005, Rosa Parks became the first ever woman to have her body lie in honor in the US Capitol Rotunda. The ostrich is a flightless bird that is native to Africa. It is extensively farmed, mainly for its feathers but also for its skin/leather and meat. Famously, the ostrich is the fastest moving of any flightless bird, capable of achieving speeds of over 40 mph. It is also the largest living species of bird, and lays the largest eggs. Air filters can be specified as “HEPA”, with the acronym standing for “high-efficiency particulate absorption”. To be given the name “HEPA”, the filter must remove 99.7% of particles with a size of 0.3 microns or larger. Sock hops were high school dances typically held in the school gym or cafeteria. The term “sock hop” arose because the dancers were often required to remove their shoes to protect the varnished floor in the gym. Kate Spade fashion design house was founded as a supplier of handbags in 1993. The brand is named for founder Kate Brosnahan Spade. The equivalent male brand is called Jack Spade. “Laughing gas” is a common name for nitrous oxide. Nitrous oxide is used as an anesthetic, particularly by dentists. It is also used in motor racing to increase the power output of engines. Laughing gas was first synthesized by the English chemist Joseph Priestley, but it was Humphry Davy who discovered its potential as an anesthetic. Once it was realized that the gas could give the patient a fit of the giggles, “laughing gas parties” became common among those could afford them. To posit is to assume as fact, to lay down as a “position”. “Geezer”, “codger” and “coot” are all not-so-nice terms meaning “old man”. Auto manufacturer Jaguar started out as a manufacturer of sidecars for motorcycles back in 1922, when the company was known as the Swallow Sidecar Company (SS for short). The company changed its name to Jaguar after WWII, because of the unfortunate connotations of the letters “SS” in that era (i.e. the Nazi paramilitary organization). We knew them as E-type Jags in my part of the world growing up, but they were marketed over in the US as the Jaguar XK-E line. The XK-E was manufactured from 1961 to 1974. June Carter is best-remembered as a singer-songwriter, and was the second wife of Johnny Cash. June performed with Cash for many years as a member of the Carter Family. Cash proposed to June on stage in London, Ontario in 1968. Both Cash and Carter maintained a friendship with President Jimmy Carter, who was a distant cousin of June. The country classic “Ring of Fire” was written by Merle Kilgore and June Carter. The first recording of the song was made by June Carter’s sister Anita, in 1963. The second recording was a little more successful. It was a recording made by June Carter’s husband … Johnny Cash. To extol something is to praise it loudly. The term comes from the Latin “extollere” meaning “to raise up, elevate”. “Tru” was written by Jay Presson Allen and is a one-man play about Truman Capote that premiered in 1989. There is a classic anachronism in the piece. It is set in Capote’s New York City apartment at Christmas 1975. At one point the Capote character talks about suicide, saying that he has enough pills to stage his own Jonestown Massacre. The Jonestown Massacre didn’t happen until three years later, in 1978. That would be “Bill Nye the Science Guy”. Bill’s show ran on PBS for four years, from 1993-97. In chess, a player who is unable to achieve a game-winning checkmate, might be able to force a draw by repeatedly and continuously placing his or her opponent in check. Such a maneuver is known as “perpetual check”. The game ends in a draw if the same position occurs three times (the threefold repetition rule), or if no capture or pawn move is made in fifty moves (the fifty-move rule). Game Gear is a handheld gaming console that was produced by Sega from 1990 to 1997. Our word “mortgage” comes from the Old French “mort gaige” which translated as “dead pledge”. Such an arrangement was so called because the “pledge” to repay “dies” when the debt is cleared. Meno Mosso is a musical term, one meaning that the music should be played at a reduced speed. “Meno mosso” is Italian for “less agitated”. The Ewoks are creatures that live on the moon of Endor in the “Star Wars” universe. First appearing in “Star Wars Episode VI: Return of the Jedi”, they’re the cute and cuddly little guys that look like teddy bears. C-3PO, or “Threepio”, is the protocol droid that appears in the “Star Wars” movie franchise. Sepia is that rich, brown-grey color so common in old photographs. “Sepia” is the Latinized version of the Greek word for cuttlefish, as sepia pigment is derived from the ink sac of the cuttlefish. Sepia ink was commonly used for writing and drawing as far back as Ancient Rome and Ancient Greece. The “sepia tone” of old photographs is not the result of deterioration over time. Rather, it is the result of a deliberate preservation process which converts the metallic silver in the photographic image to a more stable silver sulfide. Prints that have been sepia-toned can last in excess of 150 years. The International House of Pancakes (IHOP) was founded back in 1958. IHOP was originally intended to be called IHOE, the International House of Eggs, but that name didn’t do too well in marketing tests! The Latin phrase “vox populi” translates as “voice of the people”. The expression is used in the world of broadcasting to describe interviews with members of the public. The card game known as “twenty-one” was first referred to in a book by Cervantes, the author famous for writing “Don Quixote”. He called the game “ventiuna” (Spanish for “twenty-one”). Cervantes wrote his story just after the year 1600, so the game has been around at least since then. Twenty-one came to the US but it wasn’t all that popular so bonus payments were introduced to create more interest. One of the more attractive bonuses was a ten-to-one payout to a player who was dealt an ace of spades and a black jack. This bonus led to the game adopting the moniker “Blackjack”. Anonymous from Saturday: yes! Meeting In the Ladies’ Room is a great tune. Love it! This was really a fun puzzle for me. The best was that word Hajj, that I screwed up on last week. I had Hadj, won’t make that mistake again. Hajj helped in basically getting the whole right side of the grid. Guessed a lot to fill in and it all came together. Thank you Mr. Deeney, pretty slick. 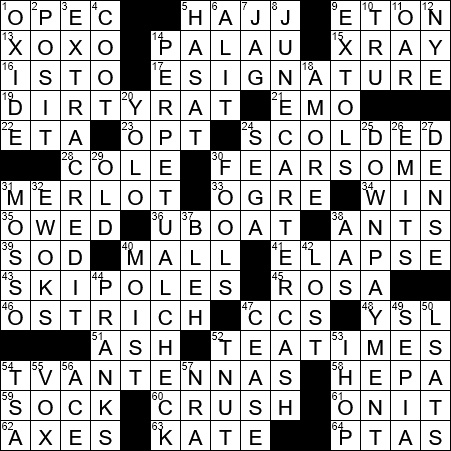 I thought it was verboten to have part of the answer in the clue, ie 43 across: skipole. Sorry, just being a snoot. I’m usually not this way. Very sloppy, Rich. Very sloppy. 9:50, no errors. Had the same objection to 43A. Agree with above. Thought it was against the unwritten crossword code to have the root of the answer in the clue. “Skiing”. and “skipole”. Someone call the crossword police!! BEQ: 18:47, no errors, but I stared for some time at 11D (a Latin phrase I’d never heard of). CHE: 16:16, no errors, straightforward. Matt Jones: 13:45 when I decided to use Google to fill the last remaining square (at the intersection of a boy band and a TV actress, both unknown to me), no other errors. LAT: 5:08, no errors. WSJ: 5:09, no errors. Newsday: Ended up destroying the paper that one was on without thinking. In the low to mid 6 minute range as I recall. New Yorker: DNF after 25:20, no errors. Couldn’t get a section on the direct left. I’m amazed I even managed that much. Too many proper nouns throughout the grid, specifically names of their workers. A very good “how not to” when it comes to crossword construction. BEQ: 54:17, no errors. Difficult for some reason, but can’t really say why seeing all the answers. Today’s grid was a typical Monday puzzle. Very straight forward. I also did the Sunday grid from the LA Times just now as well. I took a long time trying to work out the SW corner (which only came together when I suddenly recalled the motto for MGM; “Ars gratia artis” and from that the remainder of the corner came together). 7 mins 35 sec no errors. Got a little hung up in bottom left; I don’t like seeing multiple words (without a space) in a fill… always throws me for a loop, visually. 13a should have read kisses and hugs: xoxo. Hugs and kisses would be oxox! No errors, but I’ll never have your times. Agree with all on 43 A. Would have been a cute clue for the “planted” part. Also agree with @Wisconsin girl. Perhaps other editors might be involved? I had a good time with this puzzle … ( I finished it with sone ease. ) I noticed the ‘ski’ in the clue …. but it hardly mattered to me…. I didn’t pay attention to the circled letters so the “ cash and credit” did not appear that obvious.. Regarding a “down payment”, NJ is one of a few states which allow 5% down on a residence. I knew of a guy who had a metastasized cancer when he bought a house in NJ. He obviously could not get life insurance without a medical test, but he was able to buy the house at 5% down … and got mortgage insurance …. which did not require a medical exam or question thereon. So, when he died, in a year or so, his wife and kids atleast had a house all paid off. Btw, I had never heard of Palau. …. learnt something new ….